WMHT American Graduate live tweeted during the 3-5pm hours of American Graduate Day highlighting local programs and organizations that address the dropout crisis. Follow along, link to organizations, and watch our local spots below. If you have questions or comments, please contact us. Follow WMHT and WMHTAmerican Graduate on twitter. 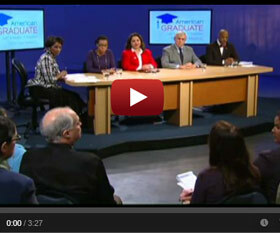 WMHT was pleased to participate in American Graduate Day, a nationwide outreach event to address the dropout crisis, by producing four segments telling the stories of local community partners and how they provide support, advice, and intervention services to students across the Capital District. Learn about WMHT American Graduate's ongoing efforts to address the dropout crisis including local spots and a live twitter feed during American Graduate Day programming on September 22, 2012 3-5pm. The twitter feed begins! Continue on to watch and learn about WMHT American Graduate's local spots. This student interview footage was edited by one of the WMHT Education Department interns. Have you been inspired to become an American Graduate Champion? Call United Way 2-1-1 to make a difference in your local community! Another issue plaguing young women in the gender gap they face in school. WMHT Innovation Trail Reporter Marie Cusick took a look at an innovative program that helps girls gain an interest in Science, Math, Engineering and Technology (STEM) topics. Connect in your community. Contact United Way 2-1-1 for volunteer opportunities so you can help make a difference in the lives of young people.